A beautiful exterior isn’t accomplished with a single large project, but rather a combination of smaller, well-chosen ones. In our experience as a leading windows company, we’ve seen plain-looking homes turn into true head-turners with the right home improvements. Here are projects that will improve your home’s curb appeal. L andscaping – Well-tended l andscaping adds color and vibrancy to your home. The important thing to remember about l andscaping is that it should complement the house, not overwhelm it. Some homeowners prefer to do their own l andscaping, but you can hire a l andscaping company to do the work. Entryways – A beautiful front door forms a favorable first impression. You can make it more effective by choosing a porch and portico design that frames and complements the front door, giving it a welcoming vibe. If your patio is visible from the curb, invest in beautiful patio doors, ideally ones that complement your front door and windows. Roof and siding – Most of your home’s curb appeal comes from your roof and siding. How well they look together is key to achieving maximum curb appeal. Some would say you should choose siding to complement the roof; others would say it’s the other way around. But if you have a permanent exterior like brick, then half of the work is done for you: simply choose roofing that looks good with it. Ultimately your taste and style that will decide what looks good and what doesn’t. Replacement windows – Curb-facing windows are essential to any home’s curb appeal, so choose replacement windows with gr andeur, like bay or bow windows. These windows add volume to most architectural styles, both visually and physically. Alternatively, you can put your own unique touch with specialty windows. Renewal by Andersen of St. Louis custom-manufactures specialty windows that will create an interesting look to your home. Unifying color scheme – Whether you plan on doing all these projects within a few months or across several years, settle on a unifying color scheme early on. It lets you accurately plan your design and material choices, and if you ever need to consult with a design expert, you only have to do it once. 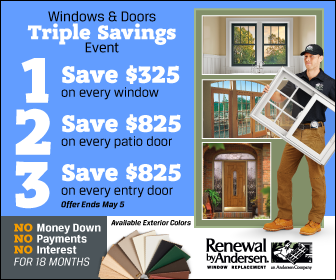 Renewal by Andersen® of St. Louis serves Chesterfield, MO and nearby areas. If you would like to know more about our replacement windows and patio doors, call us today at (314) 332-2364 or fill out our contact form to schedule a free in-home consultation with our expert consultants.